BEFORE: How do I reward myself on this stormy Friday? By having my second double feature of the marathon. Sticking with the documentaries, today’s theme is all about design. Both films are directed by Gary Hustwit beginning with Helvetica. Most people probably know it as a font on their computer. This documentary goes in depth on that typeface. I can’t wait to learn more about one of the most ubiquitous typefaces in the world. AFTER: The word I would use to describe this documentary is diverse. It covers, in great detail, both sides of the Helvetica spectrum: those who believe the typeface is clean and authoritative and those who believe it is boring and overused. I’m disappointed that they didn’t go further into how typefaces are designed. Some early design sketches of Helvetica and other typefaces are shown but the process of how one is created is fully detailed. There is a lot of type vocabulary that is alluded to (ascender, descender, baseline) but isn’t really explained fully which also left me less than satisfied. 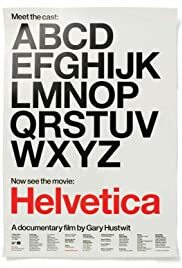 For anyone who is into fonts and typefaces, Helvetica goes in depth into the creation and meaning behind several different typefaces with a main focus on the titular Helvetica. Anyone who couldn’t care less about what font they write their next paper in or use on the next presentation should probably skip this documentary.